Box Text: Be bond, behind the wheel. pay attention, 007. This is for your eyes only. Q-Branch has re-engineered some of your favorite automobiles with additional gadgets and firepower. You'll need everything they've got, plus your own uncanny ability to beat the odds. The free world is depending on you. Oh, one other thing before you go 007- try to bring them back in one piece. 07-07-2012 Box Text Be bond, behind the wheel. pay attention, 007. This is for your eyes only. Q-Branch has re-engineered some of your favorite automobiles with additional gadgets and firepower. You'll need everything they've got, plus your own uncanny ability to beat the odds. The free world is depending on you. Oh, one other thing before you go 007- try to bring them back in one piece. 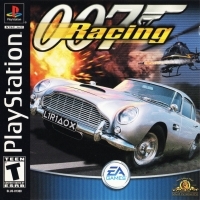 This is a list of VGCollect users who have 007 Racing in their Collection. This is a list of VGCollect users who have 007 Racing in their Sell List. This is a list of VGCollect users who have 007 Racing in their Wish List.